1. Pat the ducks dry, inside and out, with paper towels and rub all over with garlic and salt. 2. Secure the openings with poultry pins, place both the ducks in a large baking dish, breast-side down and pour over the butter. 3. Place on the centre shelf of a preheated 190°C oven. 4. After 15 mins, baste well. 5. Cook for another 15 mins, then turn the ducks over and baste again. 6. Cook the ducks for a further 45 mins, basting regularly. 1. 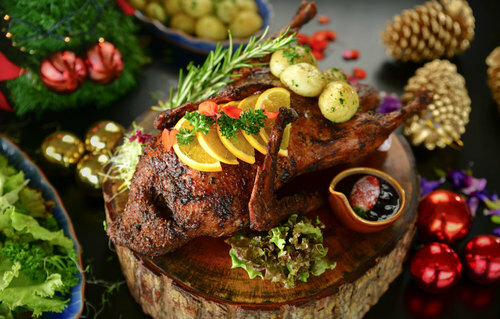 While the ducks are cooking, place the sliced lemon and orange and the juices in a saucepan with the honey and brandy and cook over low heat, uncovered, for 30 to 45 mins or until the liquid is slightly syrupy. 2. Add the tea and steep for a further 10 mins. When the ducks have cooked for the appointed time, remove them from the oven, pour off all the fat from the pan and return the ducks to the pan, then pour over the sauce. 3. Return the ducks to the oven for a further 15 mins basting once with the sauce during this time. 4. Remove the ducks from the tray, add the sauce and orange segments from the tray into a pan along with the duck stock and fresh blueberries. Bring to the boil and infuse the butter into the sauce.